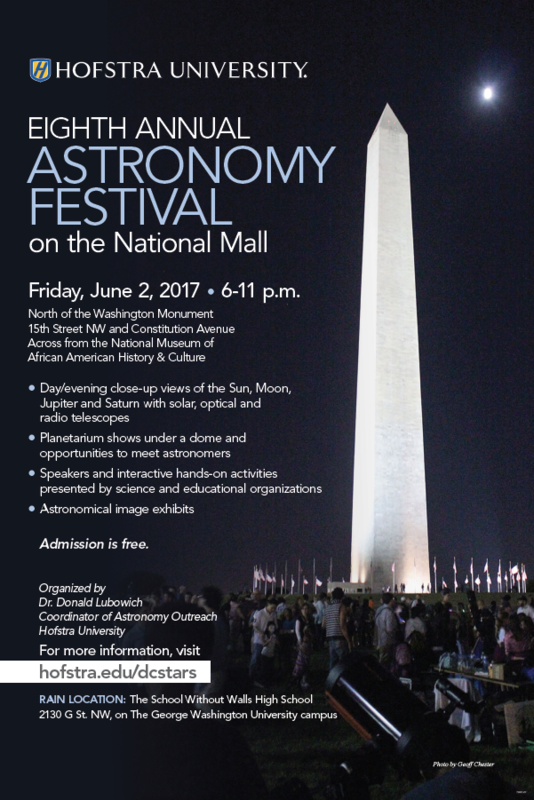 In Washington, DC, on Friday, June 2, 2017 , from 6-11 p.m. visitors to the nation’s capital will be able to look to the skies with professional telescopes as part of the free Eighth Annual Astronomy Festival on the National Mall (AFNM) , N. of the Washington Monument; 15th Street NW and Constitution Ave, across from the National Museum of African American History and Culture. Rain location: School Without Walls High School 2130 G St. NW. The AFNM will present Voyager, a dance interpretation of the NASA Voyager 1 and 2 missions and the “golden records” which traveled with them, by Neshamah - a modern dance company. This piece is to take on the broad theme of astronomy and investigate it through music, dance, and visual elements in a collaboration of the arts and science. The phonograph records contain sounds and images selected to portray the diversity of life and culture on Earth, and are intended for any intelligent extraterrestrial life form, or for future humans, who may find them. Participating Science Organizations: The American Association for the Advancement of Science, American Association of Physics Teachers, American Physical Society, Ball Aerospace & Technologies Corp., Carnegie Science/Carnegie Academy for Science Education (CASE), Celestial Charts,, International Dark Sky Association, NASA - Goddard Space Flight Center, National Air and Space Museum, National Center for Earth and Space Science Education, National Radio Astronomy Observatory, National Science Foundation, Naval Research Laboratory, Science for Society & the Public, Society of Physics Students, Space Telescope Science Institute, and the US Naval Observatory. Participating Colleges and Universities: American University, the Catholic University of American, Eastern Carolina University, Georgetown University, George Mason University, George Washington University, Johns Hopkins University/Applied Physics Laboratory, Montgomery College, Rice University/E-Planetarium. Endorsing organizations: American Astronomical Society, American Geophysical Union, Association of Science-Technology Centers, Astronomical Society of the Pacific, Astronomy Magazine, Friends of the Arlington Planetarium, Marian Koshland Science Museum, National Science Teachers Association, and the National Optical Astronomy Observatory. Astronomy clubs and organizations who will bring telescopes: Astronomical Association of Greenbelt, Astronomy Meetup, Goddard Astronomy Club, National Capital Astronomers, Northern Virginia Astronomy Club, Society of Amateur Radio Astronomers. Mission Moon 3-D by David J. Eicher and Brian May arrives! Order now!